Today Dunlop tyres are factory-fitted as original equipment to an impressive array of cars. These include the Mercedes-Benz SLK, Audi TT, BMW 5 Series and Porsche 911 Carrera. 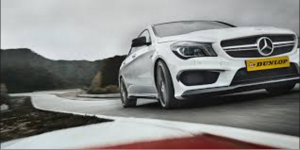 The company also works closely in product development partnerships with AMG. Though the company is much associated with all forms of motorsport, it makes a range of tyres to suit all vehicle types. The Dunlop Sport BluResponse was launched a couple of years ago. It offers a 30% fuel efficiency saving compared to the tyre it replaced, the FastResponse. Its scores on EU tyre labelling tests mean it compares very favourably with many other tyres on both wet grip and fuel efficiency, Indeed, it is recommended as a ‘best buy’ in many independent tests. It is not surprising, therefore, that its combination of performance and safety make this a popular tyre choice for many fleet managers and drivers of medium-size cars. The SportMaxx range is suitable for high-performance and sports cars. It is fitted as original equipment to many Mercedes-Benz, Skoda, Jaguar and Audi models. These tyres offer exceptional grip in all weathers. Many of them are designed using Dunlop Touch Technology, a set of features designed to offer drivers a more responsive drive. The run-flat versions of these tyres have proved particularly popular. For smaller and city cars, Dunlop offers the StreetResponse tyre. This range is designed for superior dry handling, fuel efficiency and wet braking. An innovative rubber compound technology means that these hard-wearing tyres retain their flexibility and are particularly suited to the stop-start nature of city driving.